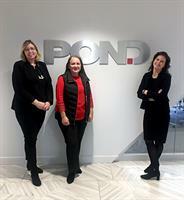 Pond Celebrates Women in Leadership - Partners - Columbia Chamber of Commerce ? Throughout their industries and in the community, Pond’s female leaders are rising to the top and our Columbia, South Carolina team is no exception. Pond is proud to employ individuals who dedicate their time and energy to industry membership groups that encourage developing new skills through training, provide support and mentorship, and recruit and retain emerging leaders. In August 2018, Anna Lucas, IIDA began a one-year term as president of the Palmetto Chapter of the Society for Marketing Professional Services (SMPS). Lucas, who is the business development manager for Pond’s Columbia office, has over 30 years in the industry and brings a huge depth of experience with her leadership. Lucas was a founding member of the SMPS Palmetto chapter when it was started in 2009 and has seen the chapter grow around 90 members in that time. The Palmetto meets in three locations – Charleston, Greenville and Columbia. Lucas began her career as an interior designer, and after 17 years transitioned to business development for the industry. She has been with Pond for almost eight years. She sees her role as SMPS-Palmetto President as an opportunity to help others in the A/E/C Industry to develop marketing and business development skills. Pond’s Esther Maldonado has recently been named president of the Commercial Real Estate Women (CREW) Midlands, an organization designed to advance women in the commercial real estate industry. Maldonado has 20 years of experience as an interior designer in Columbia, where she has worked primarily in commercial settings. Throughout her career she has designed a wide range of facility types including government, education, commercial and hospitality. “I designed so many bathrooms for commercial facilities that I gained the nickname ‘potty queen!’” Maldonado reminisces. However, through her experience designing work facilities she became an expert in accessibility codes, which led to many leadership roles as her knowledge became more and more in demand. Since Maldonado was working for so many types of facilities, she joined CREW to network with leaders in the industries of the facilities she was designing. Maldonado‘s main goal for her tenure as president is to further connect members in the South Carolina area. She plans to redevelop the website and promote scholarships for women in training roles for the industry. In another exciting leadership role, interior designer Anna Dis Sveinbjornsdottir, also from Pond’s Columbia office, recently finished up her first term as the founding president of The Hospitality Industry Network (NEWH) in South Carolina. NEWH is a group that caters to members of the service and hospitality industries to network and share experiences with others in the same profession. The group has provided scholarships and industry connections for students aspiring to be hospitality professionals. Sveinbjornsdottir has over 20 years of experience as an interior designer specializing in designing facilities for the hospitality industry. She has worked with major brands such as Starwood, Hilton and IHG. Through her experience, she has learned what members of the hospitality industry community need and how important it is to recruit and train competent leaders into the industry, which is what NEWH does. Sveinbjornsdottir saw the value of the organization as a member of the national group, so in 2015 she started gathering members and began the process of opening a chapter in South Carolina. Her term as the founding president for the chapter has focused mainly on helping members connect and receive the support that they need for their various positions. Sveinbjornsdottir helped design and launch a website for the chapter as another platform for members to connect. One of the most rewarding things she did as president was beginning a scholarship program for students training to be hospitality professionals. “It’s been great to help these students not only grow professionally, but ease the financial burden of their training,” she says. As Lucas, Maldonado and Sveinbjornsdottir look towards the future and transition within their industry membership roles, each woman plans to continue to dedicate time towards helping industry associates connect, facilitating learning opportunities and training future leaders. Pond was recently named ENR's Southeast Design Firm of the Year, and is a technology-driven full-service engineering, architecture, planning and construction management firm providing design solutions to government and private sector clients worldwide. With 25 locations throughout the U.S. and overseas, Pond is one of the fastest growing A/E/C firms in the country.